Update: Tesla, SpaceX and Slack were among 31 companies that signed on to the amicus brief Monday evening. In December, top executives from about a dozen of the largest technology companies streamed into Trump Tower for their first meeting with the president elect. On Sunday and Monday, several of those companies stood up to President Trump by signing a court motion -- along with more than 100 other businesses -- declaring that his executive order on immigration "violates the immigration laws and the Constitution." But some of the companies represented in the boardroom that day with Trump are noticeably missing from the court filing. The list of absentees includes Oracle (ORCL), IBM (IBM), Cisco (CSCO) and Palantir. Amazon is also not included in this filing, but it backed a separate legal challenge to the travel ban. Tesla (TSLA) and SpaceX, meanwhile, weren't part of the original court motion Sunday, but they signed on to it late Monday. But the current silence from certain businesses that met with Trump speaks volumes. While much of Silicon Valley opposed Trump throughout his campaign and the early days of his presidency, some big names want to maintain a good working relationship with him. Safra Catz, co-CEO of Oracle, was on Trump's transition team. Oracle was also one of the few big tech companies not to speak out on Trump's executive order last month, which banned travel from seven Muslim-majority countries. IBM CEO Ginni Rometty was the first tech executive to join Trump's business advisory council and penned an open letter about working with him to create jobs. "IBM's CEO conveyed the company's views directly to the president and the secretary of Homeland Security in person on Friday, including suggestions for how technology can help to promote both national security and lawful immigration," Adam Pratt, a spokesman for IBM, said in a statement provided to CNNTech. Palantir declined to comment. Reps for the other companies did not respond to a request for comment. IBM and Cisco each previously put out tame statements in reaction to the executive order, citing the value of diversity. Related: Elon Musk's surprising secret weapon: Trump? 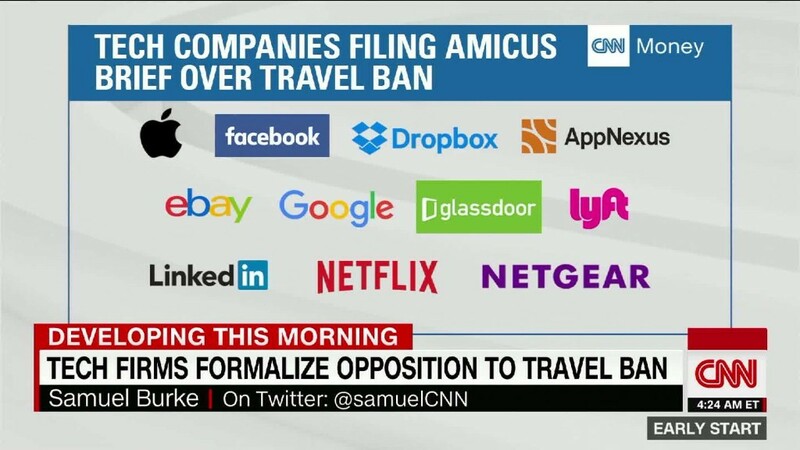 At least some tech companies absent from the amicus brief may find their way into the legal battle. "There's very obviously a community of like-minded people that are in touch and ready to act," Amol Sarva, cofounder of Knotel, one of the companies that signed the amicus brief. Slack, a billion-dollar messaging startup, wasn't included in the initial brief Sunday. But like Tesla and SpaceX, it joined on Monday. "We heard about the amicus brief when it appeared in the media, and of course we support it," a spokesperson for Slack told CNNMoney. Elon Musk, the CEO of Tesla and SpaceX, is now a member of two different councils advising Trump. His proximity to Trump has encouraged Tesla investors. "Activists should be pushing for more moderates to advise President, not fewer," Musk wrote in one of several recent tweets defending his position on the councils. "How could having only extremists advise him possibly be good?" Musk criticized the travel ban in one tweet as "not the best way to address the country's challenges." "As soon we saw the brief this morning, we insisted on being added," a Tesla spokesman said Monday. Other companies may choose to sit on the sidelines. The big four telecom companies -- AT&T, Verizon (VZ), T-Mobile and Sprint (S) -- are absent from the filing. They were also quiet when the executive order was announced last month. AT&T CEO Randall Stephenson said last month that he was optimistic Trump would push through tax and regulatory reforms, which could be beneficial to its business. AT&T (T) is looking for regulatory approval on its mega merger with Time Warner (TWX), the parent company of CNN. Trump slammed the deal during the campaign and said his administration would not approve it. T-Mobile's CEO also recently hinted that a merger with Sprint could be more likely under a Trump administration. AT&T declined to comment for this story. Reps for Verizon, T-Mobile and Sprint did not respond to a request for comment.